At Cassel Bear, we spend a lot of our time strategizing, copywriting, pushing pixels and sketching – all in the service of our clients’ marketing needs. But every once in a while, we get a little break in our daily grind to do something a a little different and often exciting. 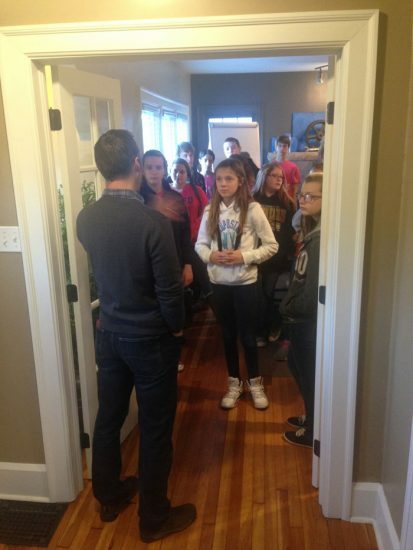 Such was the case on October 29th, when some students from Faircrest Memorial Middle School paid us a visit. With their art teacher, Amy Eibel, in tow, a group of twenty-some students descended upon our cozy office, ready to find out what went on in the daily life of a marketing agency. The trip was part of a day-long initiative for Faircrest students, during which several busses take students around the community to get a taste of several different occupations in which they’re interested. This particular bus – filled with creative types – visited our agency, an art gallery, the Canton Museum of Art, and several other stops, getting an opportunity to speak with artists who’ve found jobs everywhere from corporate settings to the fine art world to freelance work. At Cassel Bear, we walked students through the process of how a marketing piece – be it a website, billboard, brochure, logo, or new video – comes into being. Our principal, Karl Bear, talked about how he and his wife, Karen, founded the company and gave some brief insights into how we think about strategy. Then Account Manager, Valerie Shaver, explained the sales process and how we help a client determine what message they’re trying to convey and how best to convey it. The real treat for the students was meeting two of our designers, Jesse Ewing and Matt Markiewicz, getting the opportunity to look over their shoulders at marketing artistry at work – both with pen and pencil and digitally. Finally, Creative Director Craig Joseph treated the Faircrest students to some fun examples of finished work – even giving them a few take-homes to enjoy. It was great to hear some clever questions from students, and also exciting to see their eyes opened to the possibility of using what they’re learning in their art classes in the professional world. Because, let’s face it, it never hurts – when you’re a creative and artistic type – to have a bit of encouragement. There are so many reasons NOT to pursue your passions: economics, “practicality,” familial or societal expectations, fear, trouble finding resources or training. So Cassel Bear was honored to be a part of helping these middle schooler envision how their gifts and skills might play out down the road if they opt to pursue a creative career in marketing. Thanks for stopping by, Faircrest!